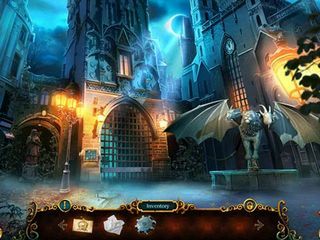 Elephant Games created a new high quality hidden object puzzle adventure game. Chimeras: The Signs of Prophecy Collector's Edition is a wonderful adventure to Europe that challenges you to rescue the city of Munich from evil at its best. 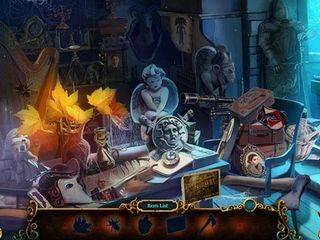 Chimeras coming to life, secret societies, mysteries murders - all those things that make a good HOPA game story! A solar eclipse in Munich has lead to some devastating events. A shadow covered the city, supernatural activity had place, and a number of terrifying murders occurred. Then you learn that a fortune teller fortold the coming of a savior of sorts. And you are supposedly the one. The cool thing about the story is that all your choices lead to certain results leaving the destiny of the city in your hands. Will you choose progress and building up or destruction? You can try the game and decide for yourself. The games graphics scream mystery and evil intention. The music helps keep this "end of days" atmosphere. The voice overs are great. The game offers three levels of difficulty and a customizable mode with adjustable hints and skips. A map is available to you right away. It is interactive and transports you where you need. You also have a djournal to keep track of all the information. There is also a strategy guide and a secret room. Morphing objects, achievements, and collectibles (tarrot cards and chimeras) enhance the gameplay adding more things to think about! All the puzzles that you are going to have to solve while you make your way through the game are mostly easy (but it depends on your skills, and you can change the difficulty level as you play). All are nicely done and well thougth-through. There is a bonus game that challenges you to work on a murder of a sicret society member. The hidden object scenes seem to be pop up less frequent that the puzzles. They have different kinds of lists of items to find. You are going to get wallpaper, music and artwork when you complete the game. 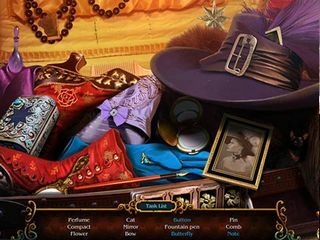 This game is amazing for the fans of the hidden object puzzle adventure genre. You can also try it out for free first! This is Chimeras: The Signs of Prophecy review. Download this game here.